Thanks GG, you’ve just answered my question about Abbott’s Captain rubbing up against Steggall. If I’d known it was that Orange Crush character I’d not have even asked. Yeah, the opinions of people with clear biases who spend all of their time posting on a political blog are the real pulse of the electorate. I forgot. How silly of me. It says Page Doesn’t Exist. Is the aim to discuss politics or to mirror the ‘pulse’ of morons? We have two election Captains at the moment. KK is Shorten’s ‘Bus Captain’ and the other side have Captain Getup. I think one is going better than the other. Bill Shorten has ruled out ending the world if elected PM on May 18. I’m sure every on is releived. I’ll take the morons, any day. Much more tolerable than the pseudo-intellectual elitists. We have had two polling companies call our landline this afternoon, the latter a robopoll. Plus a call to my mobile and probably my wife’s mobile (she didn’t answer). Seat is Swan. Bluey is 100% indifferent to Greens’ negging of occies. On Bluey’s current scoring, Labor will bound ahead and the Greens will go backwards. Which would be pretty well on the mark. Neggers never prosper. Bluey might have to revise his scoring approach because he has the Coalition bogged down on zero change. That has to be wrong. It has been posited that we should leave enough enough coal and oil in the ground to allow future generations to restart the industrial revolution after a global disaster – nuclear war, bolide impact, whatever. Given that most delusion-makers couldn’t give a stuff about generations already born, let alone the remoter future, that ain’t going to happen. Shorten went the whole hog and promised not to launch Armageddon on March 19. I’ll never be able to unsee it. Ch 7 news showed a clip of Morrison walking along a balcony to Queensland LNP HQ today. He certainly looks overweight and unfit. That’s not surprising as he seems to indulge in junk food and beer. Another five weeks of that diet and he could have trouble maintaining the frantic pace demanded of politicians campaigning. And Peter Dutton has Major Disaster. 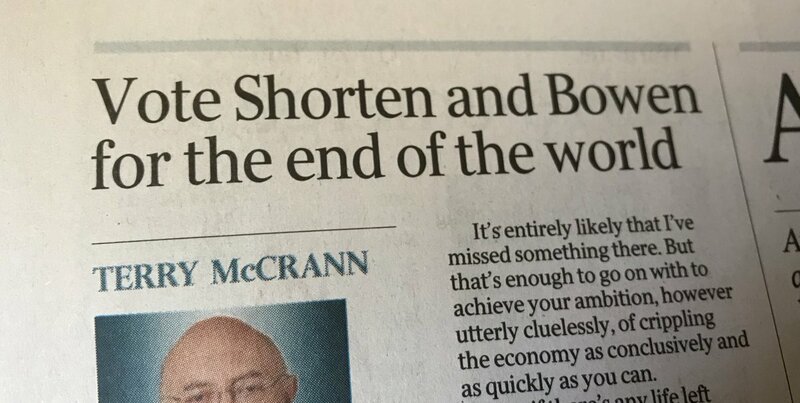 Given the juvenile, anti-women creeps who infest the coalition parties and their most ardent supporters, I can well imagine how puerile the clip was. Esp if it was too puerile even for today’s Liberals to remain on that twitter feed! Would you like a choc biscuit? He also lives on very little sleep and none to very little exercise. Further causative factors for weight gain. If anyone else is betting on the individual seats, I found Spence has the ALP at 1.14 at the moment on Ladbrokes. It is on a 17% margin. So it is fair to say there is easy money to pick up there. I can describe it to you, if you are interested. Why have the conservative reactionaries given Capt GetUp an Asian accent in this video? What are they trying to insinuate? That it’s Asians who are trying to erase Australia’s history from being taught at schools? If the question is ‘do you want a habitable planet or money?’, a rational person does not answer ‘money’. Anyone else think that Captain Getup may be demoted to Private and drummed out of the campaign? I just wish he’d keep his frotaging private! It is hard to remember anything quite as bizarre, as dumbass or as self-defeating. It is the sort of thing some failing ad man would come up with. Captain Getup is funded by the Advance Australia, who are “independent” of the Liberal Party….. so it makes the Liberals look like morons whilst they have no control over him. Also it is a strange Asian American accent I thought. Possibly an International School accent. 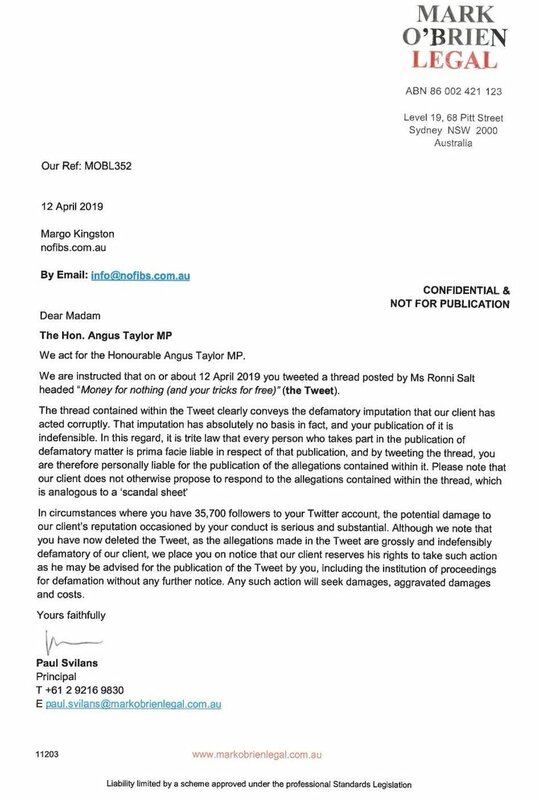 I see Angus Taylor is threatening journalist Margo Kingston for retweeting some allegedly defamatory information. Only problem is Margo denies reteeting and there is evidence to support her response. This looks like another Liberal heavy handed cockup! What purpose does he serve? I can’t imagine how coalition supporters can think he is helping their cause. Unless of course, their campaign strategy was implemented by Young Liberals. Mark O’Brien legal, now where have I seen that law company before? Pfft. They call that a threatening letter? It’s pretty clear from the content that they’re not suing and have no intention of doing so. Does anyone know about water buy back schemes & those allegedly profiting from them? A twitter account on the matter has been closed however there seems to be PDF of the thread in archives. Uh huh. Its purpose is to intimidate. Personally I don’t mind folk on the left of me because I realise we we need to make common cause across the ideological divide. Then there are the Greens. Planning for a Gillard era redux: “sorry middle Australia. You voted for a government that was going to do X by 2030 and Y by 2050 and had a plan to acheive that [thereby moving the Overton Window from reactionary to progressive]. SURPRISE: you are going to get Y by 2030”. For the Wiggle, Pegarex, bites Quoll and Firefox its all about “forcing”, and “pressuring” labor. Call me old fashioned but that’s just attempted blackmail by terrorists. Greens. Go. Get. Fucked. Labor’s offer to you is this: nothing. Breaking news the LNP are leading finally in the polls and will win the May election by a landslide. Perhaps Angus Taylor’s lawyers could be rubbed up by Capt GetUp. Steggall is a mother and an Olympic Medallist. She’s a candidate and someone whom I would not personally vote for. However, this disgusting performance needs to be condemned across the political spectrum. What is it about Liberal supporters and victimising women? Egotistical greens are about the same level as Liberals. Representing the failed Daily Telegraph against Geoffrey Rush? Mark O’Brien Legal seems to be successful in giving the allegations good publicity.was that their intention. Has Angus Taylor actually denied them? It’s particularly egregious of Angus Taylor and his band of merry lawyer thugs to threaten Margo Kingston, who has only recently recovered from severe PTSD due to intimidation, verging on the violent, from Liberal thugs threatening her previously.